To the left of the speedometer sits the power gauge, which lets you know how much charge you have left in the battery. Let it get too low and various battery shaped icons and lights start flashing telling you top find a charge point ASAP. Ignore that and a tortoise icon appears to let you know the car is about to enter its limp-home-slowly mode. On the other side of the main gauge is a simple LCD odometer. 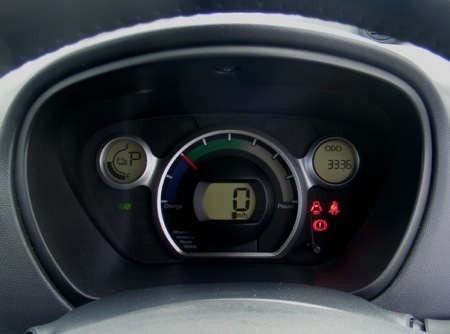 We asked Mitsubishi why the charge gauge can't be set to show the remaining battery capacity in terms of miles available to drive rather than just as a simple 'fuel gauge' and was told that getting such a system to show the remaining range with any degree of accuracy was extremely difficult due to the impact that driving style and terrain can have on effective range. Nissan's forthcoming e-cars are rumoured to have just such a system, and one that communicates directly with the integrated satnav system to determine if your chosen destination is within current battery range, presumably by basing its calculations on average power demand over the ground already covered. Sitting between the seats is a transmission lever with the usual automatic settings for Park, Reverse, Neutral and Drive. Only the presence of positions marked Eco and B suggest that this is not your run-of-the-mill automatic transmission. Of course, it's not strictly speaking a transmission lever at all as the iMiEV only has one speed and doesn't actually have a gearbox. To get under way, you simply blip the remote central locking, get in, deactivate the immobiliser and then turn the knob that sits where you would expect the ignition key to be until the instrument panel flashes up “READY”. All this happens in complete silence, which is fine if you've driven an electric car before but can be a little disconcerting if you haven't. 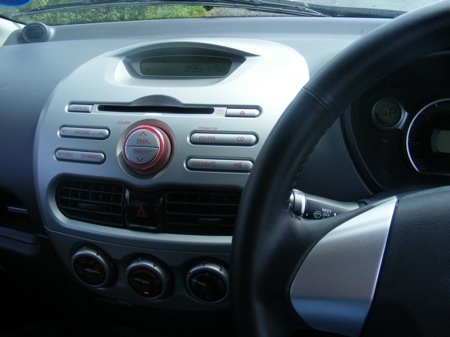 A bigger issue is remembering not to get out and walk off leaving it unlocked and 'running', but final production versions of the car will have something more along the lines of a conventional ignition key and immobiliser rather than the on/off knob fitted to the test car.